In the autumn the leaves turn colors and fall from the trees, bringing new awareness to their beautiful textures. And in the spring, the new leaves and flowers inspire us after a long dreary winter. What can we do with these leaves and flower petals? Use them with your polymer clay, of course! This tutorial shows how to make a pendant from polymer clay, mica powder (such as Pearl-Ex or even eye shadow) and leaves. You can color the pendant any way you like, using the shimmery mica to bring richness to the textures. This free Mica Leaf Tutorial is an example of and a great introduction to the way I write tutorials, which are a bit more comprehensive than many others out there. Feel free to download a copy of this tutorial for your own enjoyment and work through the project, learning how easy it is to make great mica leaf pendants. Please feel free to share this page with others, bringing them here to get their own copy of this free tutorial. Thank you! The Mica Leaf Tutorial is nearly 30 pages long and contains 45 photographs. The download is a neatly formatted pdf document that’s easily viewed on your computer, laptop, phone, or other device. My tutorials are very comprehensive, well organized, professionally laid out, and remarkably easy to follow. They include a table of contents, lots of tips and tricks, and include a resources section for where you can find supplies. Purchased tutorials include full customer support by email by which I’m available to help you enjoy your tutorial to the fullest. Text and images in this tutorial are Copyright © 2013-2015 by Ginger Davis Allman, of The Blue Bottle Tree, all rights reserved. That means you can’t share this tutorial, teach or give it to friends, post the file or contents online, or sell it, etc. However, your creations are always yours to sell, share, and enjoy as you desire. I always appreciate credit and a shout-out whenever possible. Thank you! And cracking problem, I turn to you! And that is only one of few times. In short any time I needed help you were there for me. And when I wanted to perfect my tecnique of designing with real leaf, I downloaded your tutorial and it was wonderful. I made few items and they all look good. These pendants are so much fun to make and the choices of leaves and color make each piece unique. Ginger … I’ve thanked you via email and I truly appreciate all the interest you’ve shown … thank you once again for a marvelous tutorial!!! This was my first tutorial from the Blue Bottle Tree and I loved it. It taught me so much about using mica powders and using natural objects to create a design or pattern. I’ve used it many times. My close friend, Nancy, liked my first pendant so much that she bought it on the spot! This tutorial arrived at the exact time that I wanted to do an autumnal piece featuring fall leaves. My earlier efforts turned out badly, but your tutorial allowed me to produce a lovely pendant. Mica powders proved to be one of the missing links to success, so much so that I also made leaf earrings to go with the pendant. Then I made a bracelet, as part of the set. I have lost track of the number of compliments I’ve received. Thank you so much for a rewarding experience. It’s not often someone comes across a free tutorial that makes little idea-sparks fly in their head… but this is one of them. The descriptions coupled with her photos make for an easy to follow tutorial. If anything, I would call this a Gateway Tutorial. I got a little taste of her work, and I just had to go for more! How can i get a copy of this tutorial emailed to me? Just use the contact form in the menu above and send me a message. Yours is on its way now! I love this tutorial! It’s broken down into clear, easy to understand steps. 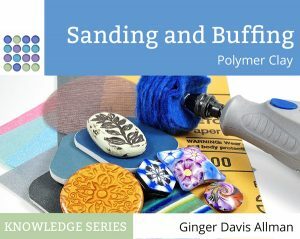 As always, Ginger gives lots of hints and tips for finishing. This ensures you get professional results. It’s a perfect project for when you need a quick gift!